An internet story regarding the influence of feral hog predation on rattlesnakes has been widely distributed. Essentially, the internet fervor relates back to fear of rattlesnakes. As the stories go, rattlesnakes refrain from rattling because the noise attracts the attention of feral hogs, who then kill and consume the snake. Not rattling is assumed to be a trait quickly evolved to avoid predation by feral hogs. Non-rattling rattlesnakes are seen as a larger threat to the unknowing human that treads nearby. Dr. Dale Rollins indicated the story has gone viral through the ranching and hunting community in west Texas. "I don't give much credence to the observation, nor the correlation with feral hogs. Rattlesnakes have been rattling for hundreds of thousands of years, and to think that a recent invasion of feral hogs has silenced them (suddenly) is a big leap. I suspect feral hogs will and do eat rattlesnakes, and I have heard on several occasions ranchers say something to the tune of 'since we have had hogs we don't have as many rattlesnakes,' but such statements/observations are purely anecdotal. I suspect we would all be nervous if we knew how many times we've been within striking distance of a rattlesnake that never buzzed, struck, or moved. Whether rattlesnakes are any more or less frequent in their buzzing is speculative; I doubt that there's any evidence one way or the other." Dr. Jim Cathey, a Certified Wildlife Biologist, suggested that we often look for quick linkages between cause and effect and the linkage between hogs and “rattleless” rattlesnakes has not been validated. Rattlesnakes go undetected, using coloration and stealth to remain undetected by their prey and animals that prey on them. When enjoying the outdoors, it is smart to have heightened awareness of where your feet and hands go to avoid an accidental bite by a venomous snake. Snakes, no matter what species, have a job to do in nature. Often they consume mice and other small animals that may pose a problem for humans. Chip Ruthven, a Certified Wildlife Biologist, relayed the following information regarding his interactions with rattlesnakes. "I am sure feral hogs do eat snakes on occasion, but they would most likely avoid a rattlesnake. I do not recall snakes being listed on any of the feral hog diet work that has been done in Texas. Snake predation by feral hogs is most likely insignificant at best. While doing rattlesnake telemetry at the Chapparal Wildlife Management Area, I walked (usually within a few feet and quite often a few inches) up on numerous snakes, hundreds of times. I even stepped on rattlesnakes with radio-telemeters on a few occasions. I elicited a rattle on only 3-4 occasions out of a thousand or so encounters and I never had one strike in the field, even when I stepped on it. Rattling gives their presence away and it is the warning of last resort. Usually laying motionless and letting their cryptic coloration conceal them is their preferred method of remaining undetected. Most folks do not realize how many rattlesnakes they probably walk within inches of while in the field. I too have not seen as many snakes as usual this year. I do not know the reason, but I would not put it on feral hogs." So the bottom line is that there is no scientific evidence to back up such claims. 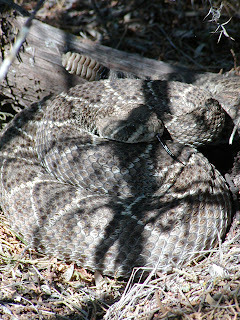 Rattlesnakes will rattle (or not rattle) when and where they feel like it, irrespective of the presence of feral hogs.